Last week I posted our Foam Dough recipe which uses Shaving Cream and Cornstarch as part of the 12 Months of Sensory Dough Series. What I didn’t mention is that recipe came from a day we called “Shaving Cream Fun”. Before the boys even woke up, I set the house up with stations of shaving cream activities. 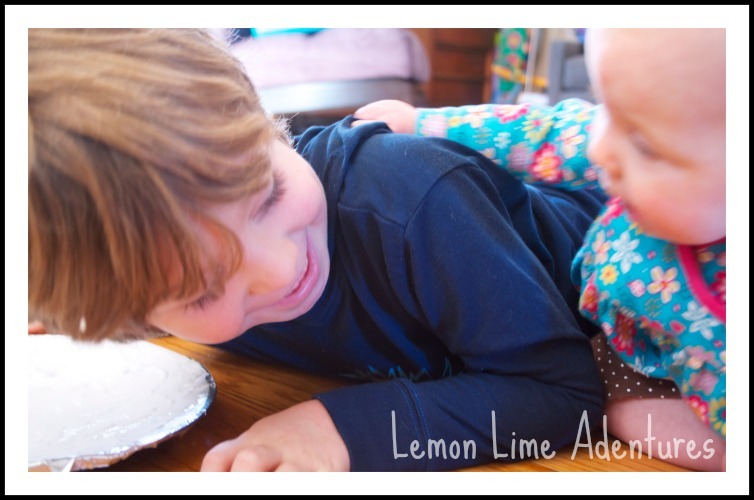 I made sure to include a variety of sensory and learning activities and I can’t wait to tell you about them so you can try them too! Want to know what’s great about shaving cream? It cleans up easy, its inexpensive, and almost every kid LOVES to get their hands in it which encourages learning THROUGH play! Station One was on the back storm door. I put shaving cream squirts on the glass and waited for Bones to arrive. He immediately smushed the shaving cream. The benefits of sensory play are almost limitless. He squeezed it in his hands. He smeared it on the window. He explored the textures. H described what was happening. He was thrilled. He is my artsy child so immediately he began making shapes and designs in the shaving cream. If he made a mistake…. What was great about Station One is that it was not only good for explorations with texture, language and art… it was also a great way for Bones to strengthen his fine motor skills. He worked on lines, fine motor control, directionality and much more. I let this station be a free form station because I wanted to encourage word/language arts play later in Station Three. The benefit of having stations is that I am able to help the boys with different skills at the same time. They are two years apart and are very different learners. Setting up different areas is essential in a smooth homeschool day around our house. Station Two was set up by the basement door. One glob of shaving cream went into each square (I used 12 squares). I put a large chart paper on the wall with the multiplication facts already written out. Legoman used the sections as an array. This allowed him to visualize each multiplication fact and use hands-on learning to master a skill he would like to learn. Station Three was set up by covering a plastic plate with foil (for easy clean-up) and putting a glob of shaving cream in the middle. Beside the plate, I put the fluency practice for the week, the dry erase board, and a towel (for easy clean-up). Bones had to read the words on the fluency chart. He had to write the word with a dry erase marker and he had to write the word in the shaving cream on the plate. He did this activity until he was able to spell the sight words without looking at his fluency work. He had a guest visitor during his time at the word work station. As I mentioned before, one of the stations was part of our 12 Months of Sensory Dough series. Station Four was set up with shaving cream, Cornstarch, a bowl and measuring materials. I placed a chart and paper next to the set up so that Legoman would be enticed to document his findings as he created the Perfect Foam Dough! I did not give him a recipe, but he did make one. Be sure to read about his Perfect Foam Dough Recipe! I really enjoyed our Shaving Cream Day of Fun. It was easy. It was fun. What was your favorite station? Have you done anything fun with shaving cream? I would love to hear! Have you checked out our Pinterest Board for Sensory Activities? I can’t wait to hear what you would like to see next. I am open to any and all suggestions. Follow me on Facebook, Twitter, Google+, Pinterest, Instagram orsubscribe by email. I can’t wait to hear your ideas. 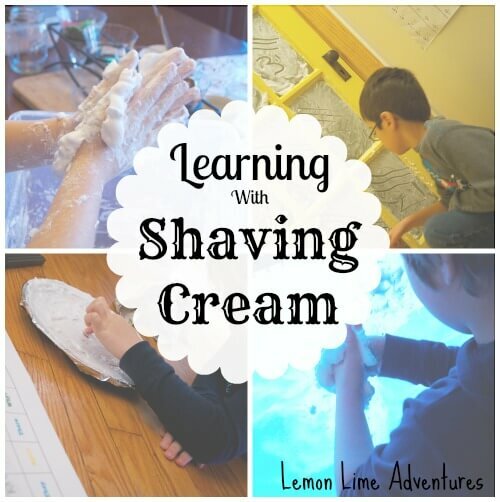 Shaving cream is super fun to play with! These are great ideas!